. إن Cairns City Sheridan Motel حريص على توفير الراحة للنزلاء، فلا يوفر الموظفون جهداً في تقديم أفضل الخدمات وضمان حسن الاستقبال. يقدم الفندق فرصة للاستمتاع بشريحة واسعة من الخدمات بما فيها: واي فاي مجاني في جميع الغرف, خدمة التنظيف يوميًا, آلة تصوير, طابعة, تخزين الأمتعة . يمكن للنزلاء الاختيار من ضمن مجموعة من الغرف المصممة بعناية لتعكس جواً من الراحة، والتي يتجاوز عددها 31. يمكنك الاستمتاع بالأجواء المريحة التي تقدمها حمام سباحة خارجي, حديقة طوال النهار. 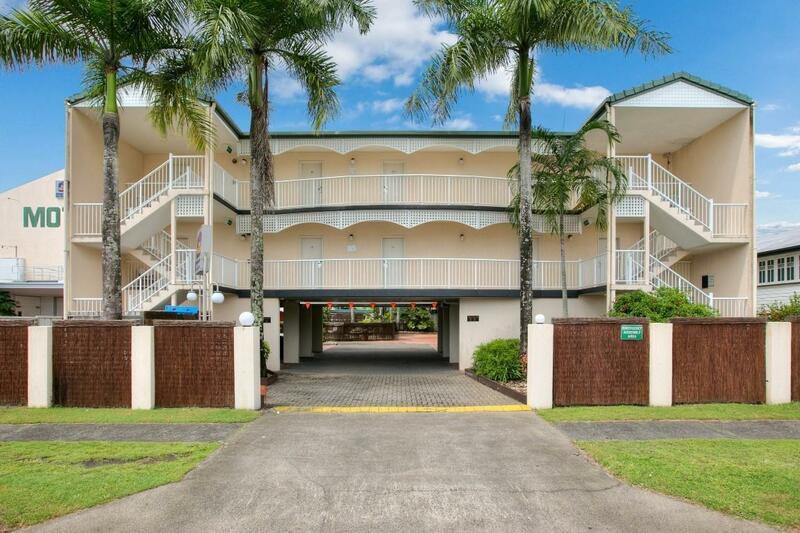 إن Cairns City Sheridan Motel هو خيارك لخدمة الفنادق الراقية في كيرنز. The hotel is located at the main road which frightened us when we arrived. However the "main road" is not very frequented during night times, and our room was very well isolated from outdoor sounds, so this was very good. Access to the airport is easy, just 10 minutes by taxi, similar as access to the city which is 15 min by foot. Overall a very good address when you do not want to pay much for luxury stays, this hotel was very comfortable and exactly what we expected. Very nice, a good recommendation. this hotel is quite close to the centre and the beach strip. the price is also very reasonable considering the prices around this area. the food options in the hotel is quite reasonable although i did not try but a quick walk to the centre you can get any restaurant you want. internet in the room worked well without any issues. staff were friendly and efficient. you can also get a cheap transport to the airport which is not far away at all. room i stayed in had a front facing balcony which was a pus. My daughter & husband were upstairs & they were very happy with the facility. My husband and I & sister & son & wife were downstairs & we were disappointed. Other guests were noisy & we had no cupboards, drawers, in fact nowhere to put anything anywhere. No hangers in the bathroom. Had a great night here. Pool. A few beers. Quiet location. Staff member on duty helpful. We appreciate your feedback Peter. Thank you for staying with us! g to write home about. Our room had a problem with tiny ants and the bathroom had no vent so was always moist and shower had mold. The location was okay but several blocks from the main drag. Very dark room - I complained and they gave me a bed lamp, yet it was very dark and I couldn't get my work done. Noisy - Somebody else's toilets pipes were running behind our wall and whenever they showered or used toilet, there was an earthquake in our room! No cutlery provided in the room, only two cups with a teaspoon. We couldn't get anything from reception as it closes at 8pm. Next morning when tried to get 2 plates and 2 sets of cutlery from the kitchen, the woman working there wasn't very happy and mentioned that they expect people to eat only 'microwaveable' food - and I didn't understand the reference as even for that one would need plates and cutlery! During our three day stay, the room was cleaned only on the first day, and the other two days they didn't clean the floor as we could see the hair/dust from previous day! The only only only good thing was location, just 10 mins walk from commercial area, and one girl at reception who was very friendly and helped us plan our first day in Cairns! My initial stay was for 3 nights. I had to extend for an extra day, and it wasn't a problem. Clean room with a view of the pool. Only 500m from the main shopping centre, and about the same distance to everything else. Very decent for a 3 star hotel. Will definitely stay again. I choose this hotel for its location, as I was only in Cairns for the nite, taxis are expensive if you are not on the the main Street into the city. It was basic but I guess for $90 you can not expect much. There was an excellent cooked breakfast just down the road, sorry the name escapes me but they had a full cooked breakfast. The room was around a side street so it was quiet. The room was clean and tidy good shower. Check in was quick and efficient. I will probably stay there again as its a short 15 minute walk to Cairns Central shopping centre. Enjoyed the fact that it was very clean & comfortable. Close to everything and if you like walking it's around 15 minutes to the Esplanade. We were on the first floor & had a balcony which overlooked the pool. There is no elevator so it would be a problem with people who suffer with back injuries etc as you have to cart your luggage up the stairs. Impressed by the room and all facilities. It had a microwave, bar fridge, iron & ironing board. Lovely big television & also a hair dryer in the bathroom. Restaurant wasn't opened during our stay which was fine by us, we bought fruit & cereal so we made our own breakfast and ate out. Our room was just to sleep and shower in as we were too busy seeing Cairns to be staying in our room. The motel was what I expected for a budget motel it was clean and walking distance to shops dining and beach front and air-conditioned with neat swimming pool. The breakfast looked ordinary but restaurants were close so not an issue. I would stay there again. The price, the location and the friendly staff. Our stay as a couple was great. The Hotel is a small but clean hotel with ample parking and friendly staff. We could walk to the shops and the esplanade with ease. Next time we visit Cairns area I will be staying in this Hotel towards the end of the trip as it is so close to the airport. Fast, free Internet; friendly, helpful staff; spotlessly clean room in very good condition. Very nice room & friendly, helpful staff. A bit far from the centre of town if walking, as I was. Across the road is Rent A Bomb hire car which I would recommend. I hired a car from them to drive to Port Douglas at the end of my stay in Cairns but in hindsight I could have used the car on the days I stayed in Cairns. we stayed here for one night before an international flight out of cairns. it's definitely value for money and for a short stay i recommend it. pros: free wifi, pool, bar with happy hour and friendly staff. an easy walk into the city centre, approx 10mins. short taxi trip to airport, for 2 people it was only a couple of bucks more to get a taxi rather than the airport shuttle. cons: the rooms and bathrooms are a bit dated but clean. no elevator, so we had to lug our 20kg suitcases up two flights of stairs. Pretty standard for a 3-star. Nothing more, nothing less. Suffice for a night or two (i had one) but for a longer stay I would search for options. I can't favour the location, it is quite a bit from the marina and diving facilities if that's your mission in Carins, but not much more than about 15-20 min. brisk walk. Staff was accommodating and helpful with local knowledge. This hotel exceeded my expectations for the price. The staff were very friendly and helpful and went out of their way to make my stay more comfortable. The room was fine, comfortable bed, balcony and tea and coffee making facilities. There was a clean looking swimming pool, guest laundry and off street parking. I would stay again. I thought this was a great hotel. The staff were friendly, the restaurant was very good and the pool was fantastic but I would never go back because there are NO lifts. Three flights of tight stairs with a heavy bag on wheels is no fun. I am fit and light weight but I still put my neck out taking the bag downstairs Also the room we had was far too small for a couple with two children. The rooms overlooking the pool are more spacious and we enjoyed dining in the restaurant. It might look abit outdated but the food was really fantastic. Never judge a book by its cover. My only gripe is the hotel had no lifts and this was very difficult as we stayed there at the end of the holiday and had done all our shopping. Despite being fit and light weight I found the stairs very difficult with a heavy bag with wheels. this hotel is very clean. room and private bathroom as well. but a little far from Cairns city. 15-20 mins on foot. if u want to my something u can go easily Cairns central shopping centre. there has airport suttle service. it's good systems.